Qualcomm has revealed specifications for two new Snapdragon mobile chips they plan to push in 2015. Or in other words, they’ve just given you yet another reason to regret purchasing that smartphone you just bought. 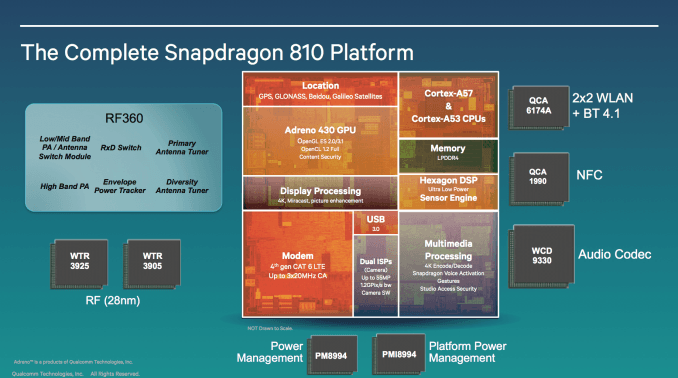 The Qualcomm Snapdragon 810 and 808 are both built on the 20-nanometer manufacturing process and feature 64-bit technology. The octa-core 810 is comprised of four Cortex-A57 cores to handle power-intensive tasks alongside four Cortex-A53 cores designed for less intensive work to help conserve battery power. This powerhouse chip will support 4K resolution displays and LPDDR4 RAM which is faster and more efficient than the current standard. It’ll also be able to handle voice activation and dual Image Signal Processors for improved imaging. On the GPU front, the Adreno 430 chip is said to offer 30 percent better performance than the 420 it’ll replace. Elsewhere we find Cat 6 LTE-Advanced and a 2-stream multi-user MIMO setup for improved Wi-Fi connectivity. The 808, meanwhile, will ship with six cores (two Cortex-A57 and four Cortex-A53), Adreno 418 graphics and support for 2K resolution screens. Even as a mid-range chip, it’s certainly no slouch. Qualcomm typically doesn’t share its roadmap this early in the process but considering increased competition from the likes of Intel, MediaTek and Nvidia, it isn’t really that much of a surprise that they are showing their hand sooner rather than later. Best yet, the chips are expected to show up in flagship Android devices starting early next year.